Izmir, the city, is the largest port in Turkey and is the gateway to the Aegean coast. Although much of the city was destroyed by fire in 1922, it remains possible to find old dwellings and mosques and churches among the narrow cobbled streets. A cable railway runs from the city to the mountains affording stunning views over the city and the Aegean. Izmir holidays offer long stretches of golden beaches lapped by warm blue sea interspersed by fishing villages clustered around small harbours. There are places where life seems to have changed little over the decades. Holidays to Izmir attract those looking for a relaxing break with a guarantee of summer sun. The area is popular with families with small children for whom sand and sea are essential items. Recreational activities include water sports for the more energetic visitor. Holidays in Izmir can be taken from early spring until late autumn as the season is long and the weather stable. 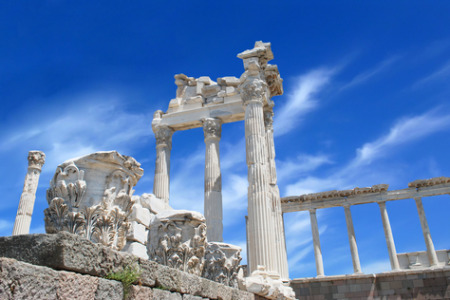 Take a look at our cheap Izmir holidays where you may be surprised to see that quality has not been sacrificed to cost. With good accommodation, tasty cuisine and great shopping, our low cost Izmir holidays will surely satisfy.